My internal dialogue has been so snooty these last few days. In my worst moments, I even heard myself saying “Well, it’s okay, but in TORONTO…”. I don’t even live in Toronto. I don’t even like Toronto. Yeah, I’m getting that bad. Visiting other provinces is like going to an open house on your street–sneaking around with curiousity, slightly judge-y, slightly inspired. Throwing a grateful, guilty nod to the realtor on the way out, because oh, you were just taking a peek. Even over 4,000 km from home, I’ve stayed in the neighbourhood. This is a good thing: I’m learning a lot. It’s always important to know where you come from and who’s on board. The food is good, the people are great. But it certainly makes for a different kind of tourism. The word “interesting” is annoyingly nondescript, je sais, but I feel like it fits here. I’ve been observing, and enjoying, and I’ve checked out what I can. I adore the football fans in Saskatchewan. I appreciate how locals respond to festivals in more remote communities. Meeting new people is fun, as are endless walks along riverbanks. The beer of the Canadian West–Big Rock, Kokanee–is good and cheap. But I needed to remind my Ontario snob self: There are less people in the prairies. Meaning there is less stuff in the prairies. And it’s flat, mostly. It’s a strange place to take a vacation, really. People live there, and work there, and use what there is to use. Sometimes, this feels small-town charming. But sometimes, it’s just dry and functional. Either way, though, it’s Canada. Our home and native land. My patriotic soft spot remains. 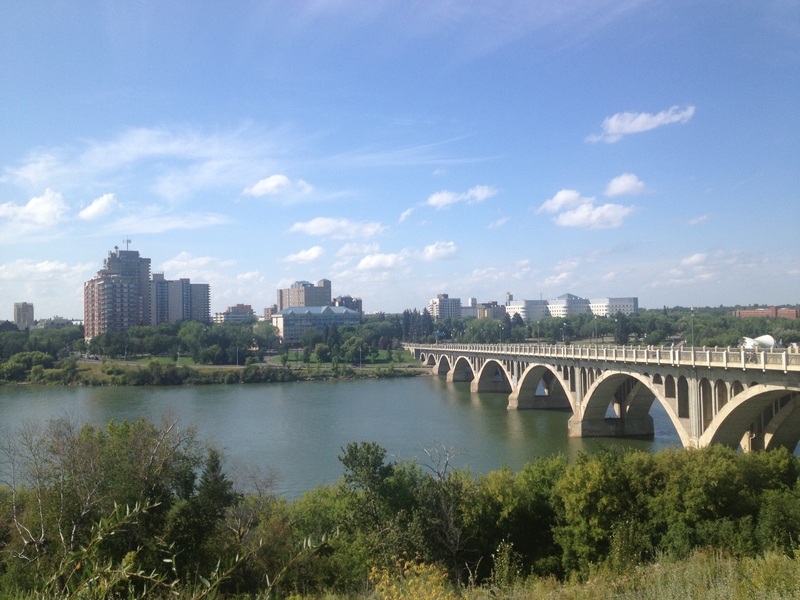 Also, Saskatoon is SUPER pretty. I got my “home sweet home” fix in Edmonton. Edmonton was busier, more commercial, more bustling–I wish I didn’t value those things, but after a week in Manitoba and Saskatchewan, it was kind of nice. It was my fix of familiarity. My host let me borrow his guitar, and I spent a much anticipated morning letting the strings sink into the softened flash of my fingertips. There were conversations over cereal, Fringe plays, window shopping, and, joy of joys, old friends. Judi and Patrick. High school buddies, close ones, the kind you stay in touch with. The latter is military, posted in Edmonton. 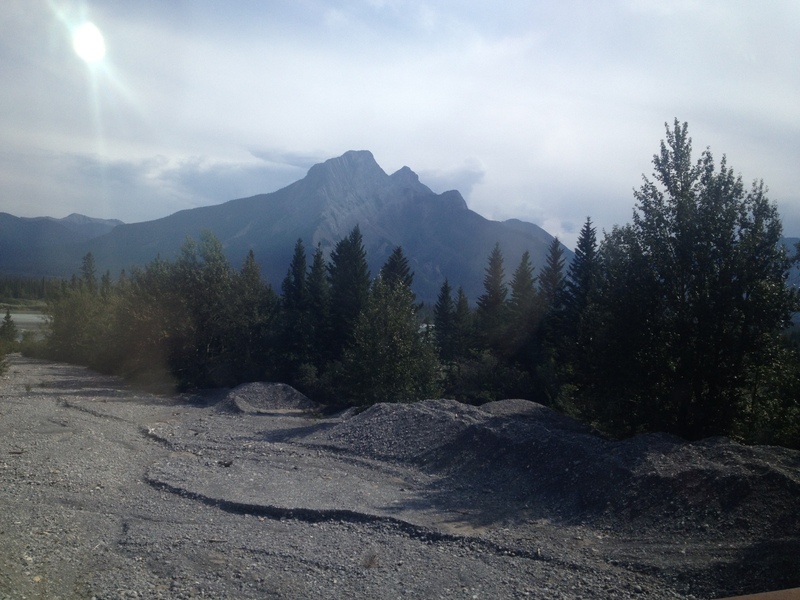 The former came down to Alberta after working in the Northwest Territories for a summer. Judi and I ziplined through the West Edmonton Mall; Patrick and I watched a giant fish get hit over the head with a mallet in a Chinese market. We found a restaurant with a “10 wings for $3.50” special. Patrick ordered 30, and ate them all. Judi ordered the the “super super super hot” wings, and ate them all. I was a wimp and did neither of those things…but watching them go crazy with their orders, it felt good to have my friends back. And then–and THEN! 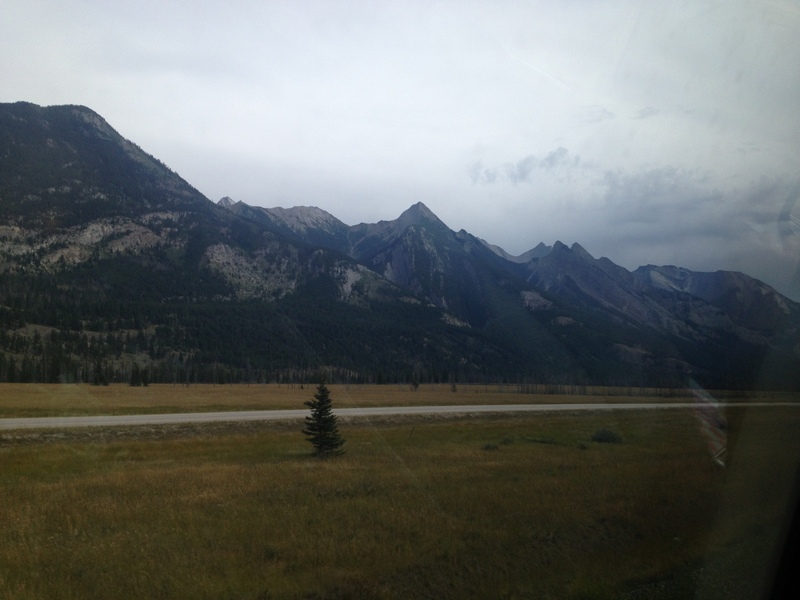 I took a train through the Rockies. 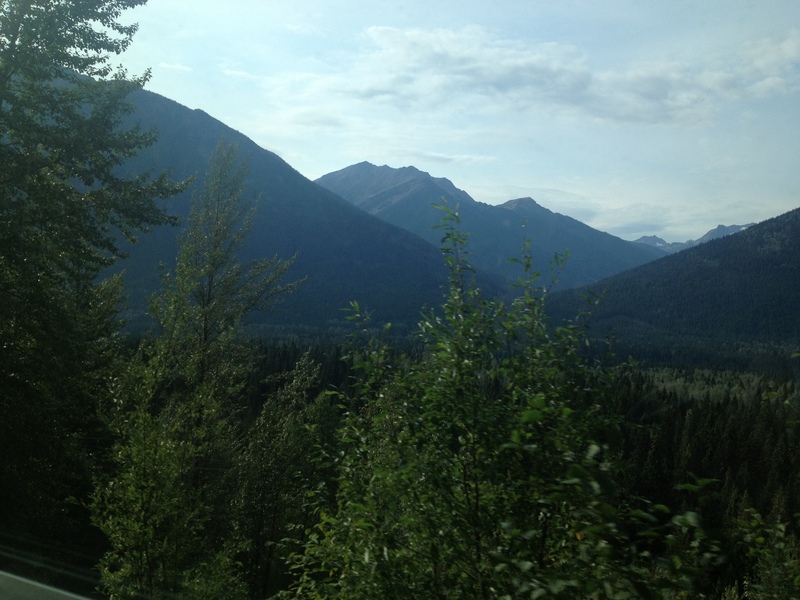 Though, if I’m being honest, there were amazing train-window moments all over the country. Mountains are amazing, but picturesque valleys and hilltop cabins and tiny, criss-crossing rivers are no less inspiring. 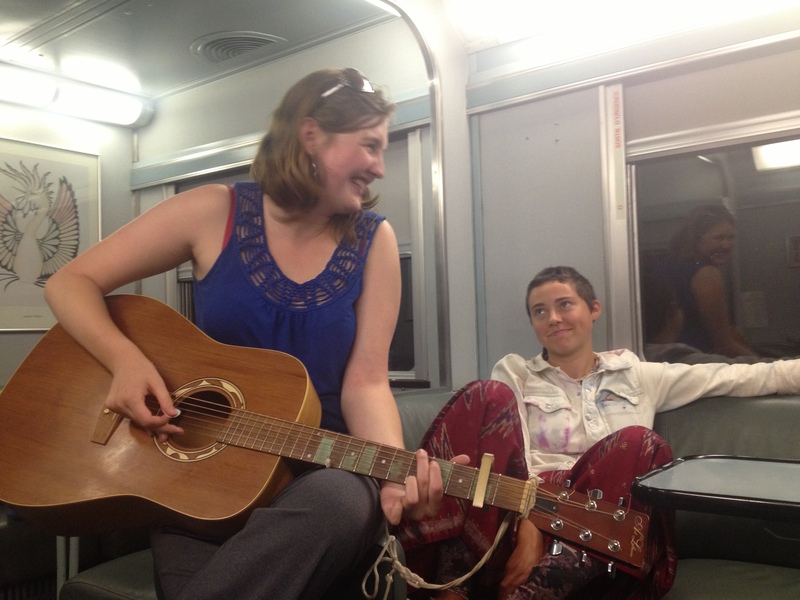 After watching the sun set over this amazing scene, a bunch of the people on the train got together for a nighttime jam session. There were two guitars, my uke…someone even brought a mbira. We sang, and sang, and sang. There was so much noise. Really good noise. I’ve lucked out so hard with people. Train people. New travel buddies. Old friends. Three hosts in a row, all beyond hospitable. And, I’ve lucked out so hard with music. Impromptu ukelele teachers, guitar sharers, singers, dancers. It’s hard to believe that I’m ready to go home, but I am. 5 days in British Columbia, and I’ll be back on a plane to Ottawa. I’ll be done with the daily goodbyes, the testing my luck, the sleeping on trains, the “I’ll order this, cuz it sounds local.” I’ll trade in my vagabond chic look for the 9-to-5 pencil skirts and blouses. I’ll play my own guitar (I miss her in a very heart-wrenching, real way). I’ll hang out with people who live down the street…and aren’t moving any time soon. I’ll have a fridge (!! ), and a bus pass, and appointments. And I’m ready. I’m ready for this last leg of my trip. I’m in British Columbia, hanging out with family, trying to deal with how-freaking-beautiful this part of the country is. We’re going to go camping, and they’re lending me warm clothes. It’s a good way to end things. It’s good to feel so ready.